All activities are offered free of charge to all residents of the community aged over 08 years old. English, French and Spanish classes given by native speakers that aim to enable residents to communicate effectively in the language. Kids, Pre-teens, Teens, Adults, English for Hospitality and Tourism and a conversational class. Dedicated and passionate students have the opportunity to gain a scholarship at our partner school Cultura Inglesa. Classes in mathematics and Portuguese offering extra support to complement mainstream learning at all levels as well as additional courses for students preparing to take University entrance exams. Football, volleyball and table tennis sessions are some of the most popular activities that we offer. As well as being a fun activity these teach children vitally important life skills such as team work and communication skills as well as helping with behavioural problems. 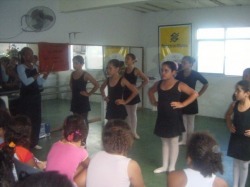 The hugely popular "Dance to Educate" project enables girls in Vidigal to perfect their plies in weekly ballet classes. Recently some of the young dancers performed at a Rio de Janeiro samba school.